The Forge Garage is pleased to offer service personnel a 10% discount. Service personnel include, army, air force, navy, medical staff, police and ambulance crew. Simply provide your staff identidy card as proof of profession and service personnel will qualify for our discount. Not sure if your profession qualifies for our 10% discount give us a call. 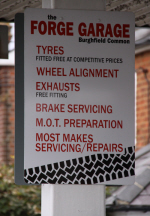 Established for over 40 years Forge Garage in Burghfield Common as a long history of helping local service personnel by servicing and maintaining their cars and vehicles. Everything from arranging and preparing customer cars and vans for MOT, servicing, repairs, tyres, exhausts and air conditioning maintenance. Forge is easy to find on the Burghfield Road just down from the Chemist and next to the parade of shops including the Fruit Shop, bakers and pet shop. Forge Garage are members of the "Trust My Garage" Scheme operated by the RMI adding peace of mind for customers.